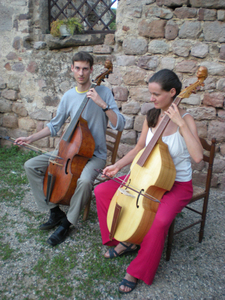 Click on the images to see larger versions. 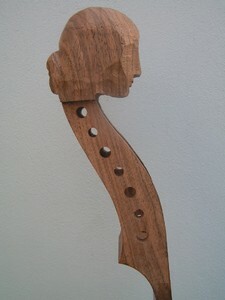 Also, a little further down this page is a set of “photo diary” pictures showing stages in the building of a seven-string bass viol. 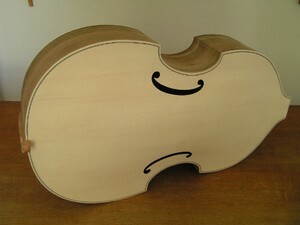 The back of the same Brensio tenor. 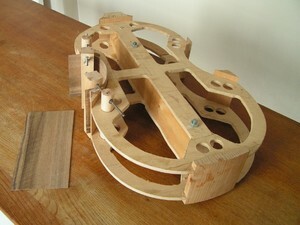 This is a photographic record of the building of a seven-string bass viol after Nicolas Bertrand, Paris, circa 1726. 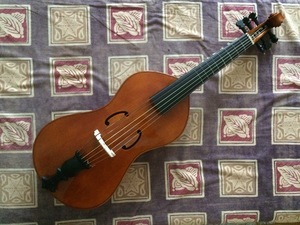 It's the viol I play myself; I built it between the summers of 2007 and 2008. 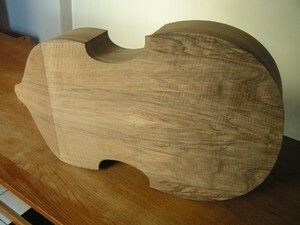 The ribs, back and neck are made from European walnut (Juglans regia). The blocks of the body are cedar of Lebanon (Cedrus libani). The front is Alpine spruce (Picea abies). 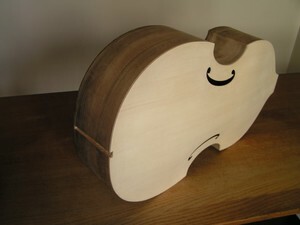 The bridge is made from maple (Acer spp.) stained black and the nut is boxwood (Buxus sempervirens) also stained black. 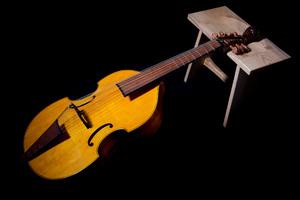 The pegs, hook bar, ﬁngerboard and tailpiece are pearwood (Pyrus communis), the ﬁngerboard and tailpiece are veneered with some beautiful burr London plane (Platanus × hybrida) with edges of black-dyed maple. 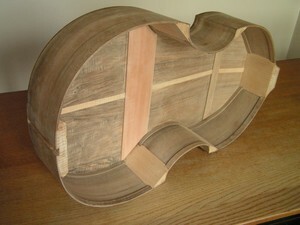 The mould with corner and top and bottom blocks attached and the first rib bent and cramped to shape. 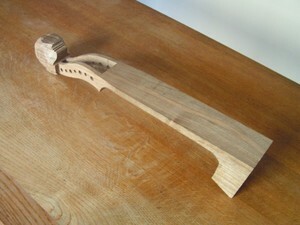 The piece of wood to the left is the second rib before bending. 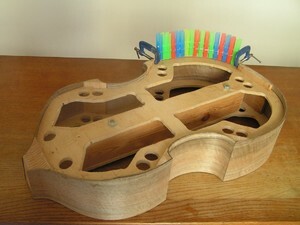 All six ribs bent and fitted to the mould and glued to the blocks. 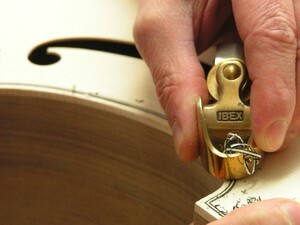 Fitting the lining strips around the back of the instrument. 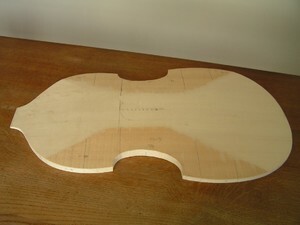 The back jointed together and ready to be thicknessed. 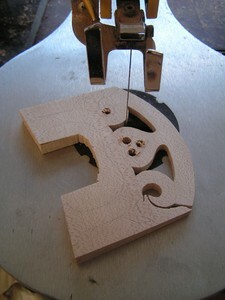 The back thicknessed and glued onto the rib assembly. 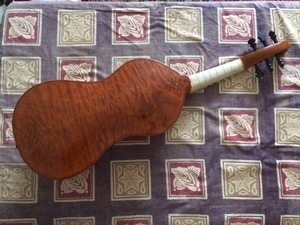 The back trimmed flush with the ribs and the purfling inlaid. 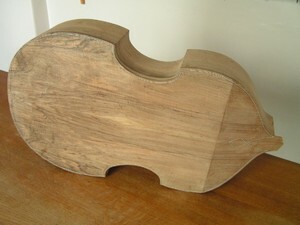 The body of the viol finished, ready for the soundboard to be glued on. 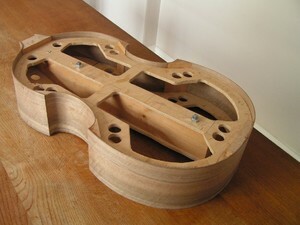 The inside of the finished front showing the bassbar. 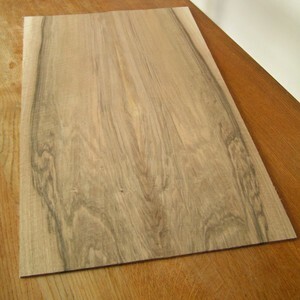 The front glued onto the walnut box. 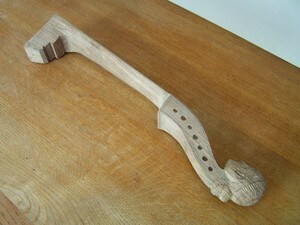 The purfling around the front. 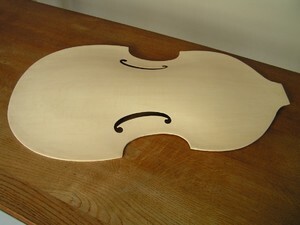 The finished body of the viol. 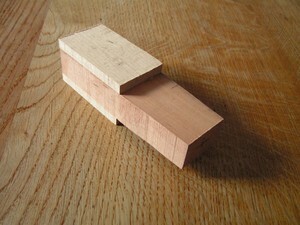 The head and peg box roughed out. 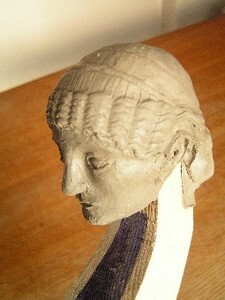 The clay maquette of the head. It’s based on a Roman female portrait bust from Pompeii, now in the archaeological museum in Naples, where I was able to photograph it. 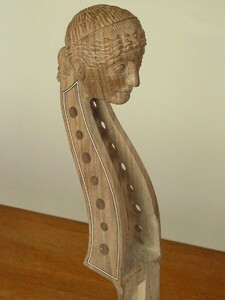 The finished carved head and pegbox. 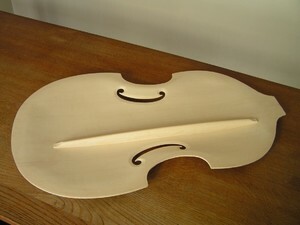 The finished viol before varnishing. 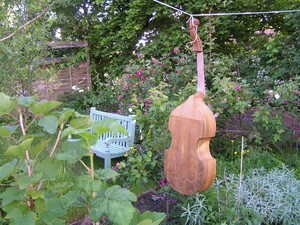 Varnish drying on a rare sunny day. 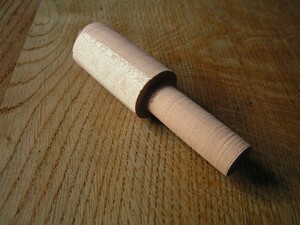 The rough blank for a peg. 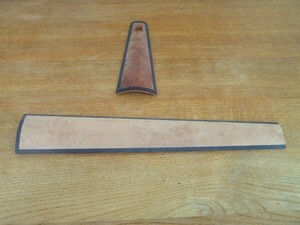 The blank turned round, with the beginnings of a shaft and a head. 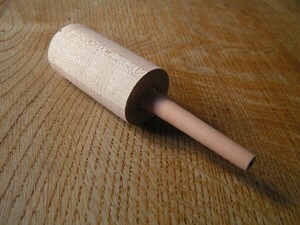 The shaft taper is now finished. 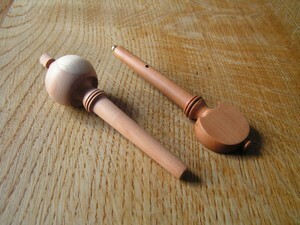 The peg on the left is straight from the lathe; the peg on the right is completely finished.